Morning, two weeks of 4.30 am wake up calls for me, including the weekend (grumble grumble). Actually I’m not grumbling, just on a crazy dead line and early mornings are the best time of day to get things done, to think and not be interrupted by the normal daily kind of stuff. Birds are barely up, not a sound apart from the odd snore from Mung’s who is sleeping next to me in a chair, unlike Maud he cannot stay in a room without me in it, its a bit like having a shadow. The odd thing about going away without him is that you feel that something is missing or has been cut off, no one following me out the door, to the loo,Â to grab a coffee, to answer the door. I digress time is of the essence so I must get on, one thing I came across when Stateside was how platesÂ had kind of reinvented themselves as theÂ new wall art. 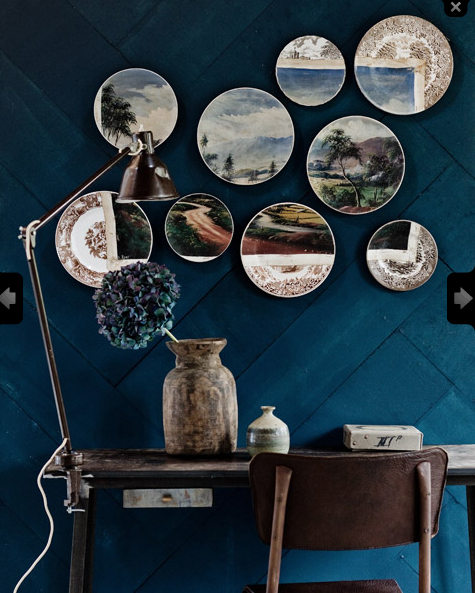 Old plates, new plates, plates embellished with cool decorative figures – hungÂ higgidly piggidly,Â hung in straight lines, whatever which way they add a lovely decorative element to alcoves or little nooks. Their circles add a lively rhythm – and in my book the more decorative and fun you go the better. Easy to find at flea markets or thrift stores, or brand spanking new which you could embellish yourself and scrawl type over or paint something fun like a portrait of your bow wow for instance. Gotta fly, crazy day today, a plate image to inspire (photography by Jeroen -van-der-spek). Oh and can I just say if those plates were against a light wishy washy pale background the impact wouldn’t be the same, just saying! Oh and before I forget (how could I) my new tableware is out in a few weeks. Square is the new round you know so imagine great huge bread platters crafted from ceramic, plates, bowls, platters all square, all hand thrown all organic in feel and ALL in the sludgiest most inkiest of hues!